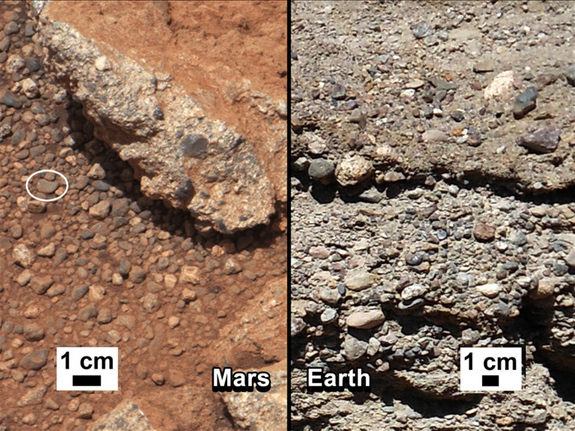 Pictured above: comparison of Martian rock outcrops with their Terran equivalent, proof of water on Mars by NASA's Curiosity rover! A whole summer's worth of catching up with 2312 and Kim Stanley Robinson press coming up! FDL Book Salon hosted a live web chat with Stan, where he interacted with members at length on a huge number of subjects! Highly recommended! Blue Mars and the Mars trilogy is more utopian in many ways, and 2312 shows the darkening of the last 15 years of global history, the sense that things will stay a mess for a long time. But this may be true at the same time that progress is made in other areas, which ultimately may prevail. So I feel like 2312 also is utopian, but in the ongoing redefinition of utopia I have long been suggesting that it’s a name for a particular kind of struggle, and that it will go on for a long time and been pretty painful throughout. But with some good results! My research these days is mostly on the internet, but also I phone scientists I know often, and I got Chris McKay to convene a lunch group at NASA/Ames in Mountain View and I went down and asked the eight or nine people there a couple hours of questions, it was great help. One change I can say for sure, since the writing of the Mars trilogy: I need always to say very clearly that Earth is and always will be the center of the human story, that Mars and the rest of the solar system can be helpful and interesting (even just as thought experiment setting) but Earth has to be our focus for the next two centuries for sure, and really, for all history to come. We all should remember that and act on that. The About SF podcast interviewed Stan at length, with two episodes available totalling over an hour! Part 1 and Part 2 available. He discusses his research about the planet Mars for his trilogy, his inspiration for writing the novels, and his ambitions for writing science fiction. Stan was interviewed for UK literary magazine Structo, Issue Eight, you can order it on their site. Stan also presented 2312 on Google Talks, and answered audience questions. Marina Abramovic, performance artist and inspiration for the character of Swan in 2312, mentioned Swan in an interview for the Wall Street Journal! I also want to create a platform to work with scientists and with new technology. I had lunch a few months ago with Kim Stanley Robinson, a science-fiction writer who gave me a new book he wrote called "2312." I'm one of the characters in the book. He said, "I saw you at MoMA, and you are great for creating galactic troubles." So I am now doing performances on an asteroid near Mercury, just so you know. With over four months in bookstores around the world, 2312 keeps getting reviews and reviews. If this novel sounds like your typical post-human epic, however, it isn't. Absolutely it has space battles and AI orgies and moons being chopped up and hurled at planets. But it's also full of strange prose-poems about science and consciousness. And every few chapters, Robinson gives us a history lesson in fragments of text that hint at all the ways humanity has changed over the 300 hundred years between now and the year when the story takes place. In this way, 2312 is able to be more than just a simple story. It's a future history, a dream of all the complicated ways we might muddle through as a species, spreading out into space without ever really fixing all the old problems that have nearly extinguished us again and again. It is a real rarity in contemporary fiction – especially genre fiction, but also in TV and movies – to find characters who are totally actualized, who speak with their own voice instead of the author’s voice, who are not just robots built to drive the machinery of the plot. Instead, each character is unique and together they interact in ways that totally make sense given this uniqueness. And then there are even more reviews around for your reading pleasure! Moon and Back, Blog Critics, Wind City Times, Experts Column, Portland Book Review, Cross Roads, Yatterings, Otago Daily Times, Dansville Online, Sunny Reads, George Kelley, Fill Your Bookshelf, Paper Droids, Pease Exchange, Omnivoracious, MC Reviews, A-Kon, and a video review by Olivier's Book Club (part 1, part 2)....! Kim Stanley Robinson, like last year, is participating in the Clarion Write-a-thon! What is a write-a-thon, anyway? It’s just like a walk-a-thon. But instead of walking, we’re writing, and instead of making pledges per mile, we’re making pledges per word, chapter, or story. Writers get support, encouragement and motivation, and the option of joining a team with a writing mentor! Those who care about the writers in their life get a way to show their support. And money is raised for a literally fantastic cause — the Clarion Science Fiction & Fantasy Writers’ Workshop. 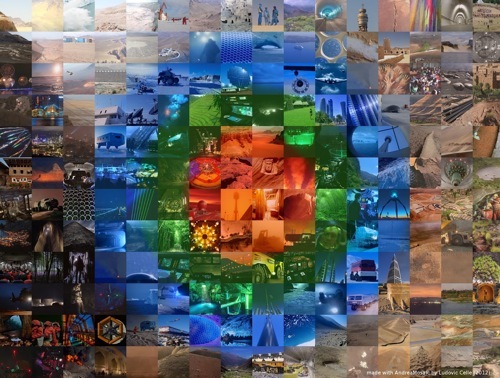 Pictured below: a Mars trilogy-inspired mosaic by the awesome Da Vinci Mars Design! A much higher resolution is available there. Another wave of 2312 material! 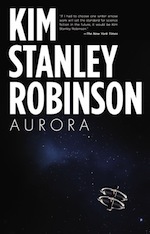 Once more, Kim Stanley Robinson was interviewed by Rick Kleffel of the Agony Column, at Stan's appearance at the Capitola Book Café on June 16 (direct mp3 link). Very entertaining and informative! Stan was also interviewed by Far Beyond Reality, in text form. A soundtrack for 2312? All of these might work as a kind of soundtrack for a reading of 2312, as they often served as soundtrack for writing it. In particular I guess I would recommend the fourth symphonies of Brahms and Tchaikovski, and the late string quartets of Beethoven, and Satyagraha. The wonderfully inventive 2312 is, in this way, Robinson’s most aesthetically reverent work to date. Science, engineering, history, politics, philosophy, parenting, love — in this novel all are reimagined as essentially artistic practices, as the sorts of ecstatic creative pursuits people might devote themselves to once liberated from the drudgery capitalism inflicts on us. It might, therefore, be Robinson’s most nakedly utopian novel, his most ambitious attempt to show us just how good life after capitalism could be. Finally: a time for play. But at the same time, 2312 could be Robinson’s least utopian novel — beginning, as it does, from the rejection of the “Mars Trilogy”’s happier historical trajectory in favor of a world(s)-system in which the ongoing historical struggle between the residual (feudalism), the dominant (capitalism), and the emergent (none dare call it communism) never crests, but just goes horribly on and on and on. Indeed, there is a suggestion late in the novel as pessimistic and unhappy as any I can recall Robinson making: that perhaps some people are just bad, that (worse still) perhaps true evil will only exist after scarcity. So much of Robinson's playfulness with the broad canvas of the solar system reminds me of a remark made by J. Robert Oppenheimer about the US building of the H-bomb—i.e., that it was "so technically sweet" that it could not be foresworn. 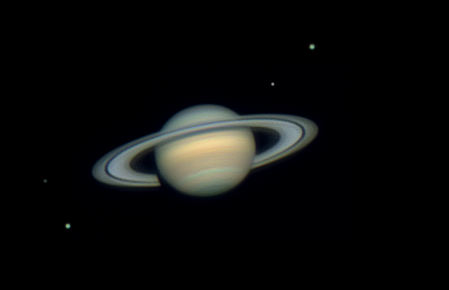 So, as a political ecologist, I mourn for the domineering technological command over the planets and the moons envisaged by this fictionally realized blueprint of the cosmos. [...] Perhaps Robinson's book may yet inspire another SF writer to think beyond the technological sublime into other realms and other plausible futures more firmly grounded in the ecological imagination and our corporeal existence and recognize that in that imagined paradisal future, et in Arcadia ego . This particular vision of the future - an environmental catastrophe on Earth, followed by a rapid and transformative expansion into the solar system - is common to much contemporary science fiction. And while Robinson's version is perhaps less plausible (and certainly less densely imagined) than that explored in Paul McAuley's stunning The Quiet War series, or Alastair Reynolds's recent Blue Remembered Earth, it nonetheless presents a future that is in turn awe-inspiring, unsettling and challenging, not least in its preparedness to demand that the reader thinks seriously about the possibilities of using technology to make other planets habitable by humans. [...] These are not small criticisms, nor is it coincidental that they are criticisms that might also be made of sci-fi's golden-age writers such as Robert Heinlein and Isaac Asimov, both of whom shared Robinson's belief in the transformative nature of scientific rationality. Yet nor do they detract significantly from 2312's real achievements, in particular its power as a reminder not just of the possibilities of science, but of sci-fi's importance in opening our minds to those possibilities. Also, reviews by The Speculative Scotsman, Adventures of a Bookonaut, The Star. Kim Stanley Robinson is continuing the promotion of his latest, 2312. Very notably, Stan was recently in the UK, where he did a panel with fellow writer and friend Iain M. Banks; they both read from each other's books, talked about writing, and in general had good fun. This blog has a good round-up of the event. Stan also appeared in Bath. In this video he reads from the Prologue to 2312. One of the things 2312 is is a question. Could we both wreck the Earth and have a rather active space civilisation at the same time? Could the Earth be thoroughly wrecked and yet also be flourishing in certain limited respects? I don’t know the answer to those questions. They’re proposals that I’ve put out there, saying could it be this way? Whether it’s physically possible or not I’m not quite sure. I have this double feeling: that the sciences are making us immensely powerful, so that the potential for a flourishing future civilisation a few hundred years from now is really quite realistic, and yet at the same time we’re in this dangerous moment, where we’re thrashing the environment and we have climate change, and it’s quite clear that politically the system is being manipulated by certain people who want to keep the destruction going, because they’re not convinced that it is destructive, or they don’t care because they don’t think it’ll apply to them or their families. So they’re going to be hard to beat, even in the best scenarios, because they have amassed a lot of money and political power resulting from money. So in 2312 I’m contemplating a future that seems to include environmental disasters like the raised sea levels, not at all unrealistic to postulate, and yet at the same time have things flourishing, because of materials science, because of medicine, because of all of the things that we’re learning. The ways we can manipulate nature and biology are becoming rather stupendous with potential. 2312 is an attempt to splash all that into one story. It’s a distorted lens aimed at 2012, at where we are right now. But the whole thing is worth reading! [J]ustice is another climate change technology that we have in the picture except for getting into this weird definition of technology as nothing but a silver bullet that we imagine might help. There's also Jevon's paradox that the better we get at efficiently using energy the more energy we use; so that and that machine technology improvements per se do not necessarily reduce our impacts because we immediately double down on how much we use. Stan was invited in the io9 video podcast and talks about 2312 (sadly, the interview feels edited down too much). Reviews of 2312 are massively pouring in, from professional reviewers and from random bloggers alike. Some are enthusiastically positive, some are more mitigated, there's something for everyone. Everything is a perpetual project of improvement. [...]It goes back to the roots of the sci-fi genre and puts at its centre utopian and dystopian visions of the social models our descendants might inhabit, with a flashy travelogue around the places they might live. It is a novel of ideas that also sets out to be tremendous fun. Kim Stanley Robinson's 17th novel is complex and sometimes bewildering, 500 pages crammed full of strange but decent characters whose actions play out against a vastly constructed utopian background. [T]he title takes its name from the year in the same way that a book might be titled "1793" or "1848" -- 2312 in this universe is a year looked back upon as a turning point in history, where the events described in the book changed humanity's course. The slow, gathering surge toward an epic conclusion merely peters out in the end. [... KSR paints] a picture of humanity as a stagnant people who are merely distracting themselves until they die (ironically delayed due to longevity treatments) [...] As I read the book, I actually thought the protagonist was a thumbnail for a moribund humanity who had reached the limit of its abilities. It was almost as if the human race was bumping up against a wall which, for all of the mind and body enhancements, it could not conceptually break through due to fundamental flaws in its construction. I tried to imagine what it would be like to go back in time to 1712 and to not only explain what the world is like in 2012, but also how it got to that point over the 300 years in between. This is essentially the task that Kim Stanley Robinson sets himself in describing the world in 2312. [...] A divide has sprung up between the spacers (the ‘haves’) and the majority of Earth dwellers (largely the ‘have-nots’) [...] The main issue I had with the book was that 2312 doesn’t quite know what it is trying to be. [...] in general there was just too much information and too many ideas fighting for attention within one book. ...and more from Washington Bus, Chicago Tribune, The Daily Mail, For Winter Nights, Worlds Without End. Science fiction legend Ray Bradbury passed away recently, on June 5th 2012 at the respectable age of 91. Bradbury was of course the writer of one of the novels that defined the image of the planet Mars in the collective consciousness, The Martian Chronicles, a novel referenced in Stan’s Mars trilogy. Of course, Kim Stanley Robinson and Ray Bradbury share the same home town: Waukegan, Illinois! Stan has also met and has spoken highly of Bradbury in the past. 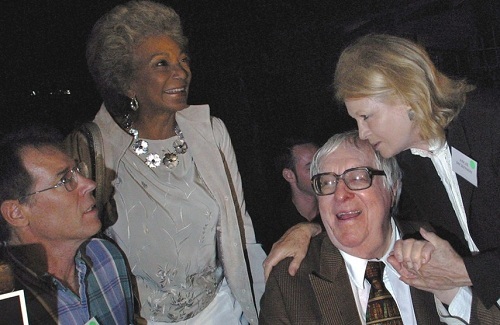 This photo (source) shows Robinson and Bradbury with actresses Nichelle Nichols and Angie Dickinson, at Bradbury’s 83rd anniversary in 2003. The celebration had been covered by Planetary Radio, and included appearances by Bradbury and Robinson. Bradbury was one of the first break-out stars from the science fiction community into mainstream American culture, and this was no coincidence but because of his open and welcoming style, and the way his science fiction always focused on the human side of things, adding strong emotions to what had previously been perhaps drier or simpler. He was a great ambassador to the world for science fiction, and was beloved in the science fiction community as well. He was a truly inspirational figure to many, because of his positive nature and his boundless enthusiasm for reading, which he conveyed so well, and for life in general. His fiction always reminds us that no matter what strange future we move into, human emotions will stay central to our story. His best stories and books will be a permanent part of American literature. We were lucky to have him and I’m sorry he’s gone. Stan also shared memories of Bradbury in this short audio interview for the Takeaway. (a shorter version aired next day). Thanks to albinoflea for the reasearch! The rockets came like drums, beating in the night. The rockets came like locusts, swarming and settling in blooms of rosy smoke. And from the rockets ran men with hammers in their hands to beat the strange world into a shape that was familiar to the eye, to bludgeon away all the strangeness, their mouths fringed with nails so they resembled steel-toothed carnivores, spitting them into their swift hands as they hammered up frame cottages and scuttled over roofs with shingles to blot out the eerie stars, and fit green shades to pull against the night. 2312 press continues full speed! As always, check out the calendar on the left for KSR readings, panels, events, in the USA and in the UK. The Planetary Society's Planetary Radio podcast interviewed Robinson (direct mp3 link), among recent exciting space-related activity such as the Space X Dragon launch and an appropriately 2312-themed video of Satrun's rings. [I]t is an open question whether the space project could be a significant help to humanity in trying to get into balance with the biophysical realities on Earth. I don't think we know the answer to this question, and it won't be easy to answer it without continuing to try to go into space usefully, and see what happens. [...] But no matter what we do in space, Earth will remain at the center of the human story. That's one of the things 2312 tries to say. But mostly the book is asking questions. It's not really saying "this could be," but rather, "could this be?" I think it may be that human civilization is so big and various that different things might happen in different parts of it, and advances in some areas occur despite massive problems elsewhere. But this is mainly a question to be asked; is that possible? Could we bootstrap our way out of some of our problems while they are still vexing us? I was forced to use the Kitchen Sink Theory of Novel Construction—again, of course—indeed, more than ever—but it was necessary, because the future is going to be a wild place, a recombinant multiplicity of clashing elements, a real mess. To do justice to realism these days, the kitchen sink is really nowhere near the end of what needs to get tossed into the mix. Also, a great hour-long panel with Robinson from last November found its way on YouTube here. Stan discusses "Valuing the Earth and Future Generations: Imagining Post-Capitalism" at the Center for Values in University of Texas at Dallas. 2312 features, among many other systems, an economy that is aided by computers to tune demand with supply. It's interesting to read Stan write about Francis Spufford's recent SF novel Red Plenty, a novel that has had trouble getting categorized as fiction in bookstore (I personally encountered it in the 'History' shelves!). According to Publishers Weekly, 2312 seems to be doing good at sales! Reviews also have been pouring in! 2312 is as flat-out a celebration of the possibilities of SF as I’ve seen in years, not only in terms of classic space adventure [...], but in terms of gender evolution, quantum computing and artificial intelligence [...], and ecological catastrophe [...]. Robinson takes on so much information here, and so many techniques, that the novel sometimes seems on the verge of flying apart from its own imaginative momentum, but it’s something of a wonder to watch Robinson pull in all the kites in the end. Readers who want only the clean narrative arc of the planet-saving space opera that anchors the narrative might find a good two-thirds of the novel a distraction, but for the rest of us it’s a catalog of wonders. Remember that U2 song “Tryin’ to Throw Your Arms around the World” from Achtung Baby? 2312 feels like Kim Stanley Robinson trying to throw his arms around the solar system, bringing the intimately personal sphere into the system-wide one, and vice versa. The result is easily one of the best science fiction novels of the year so far: a challenging, sprawling, multi-layered story that will provide food for thought long after you turn the final page. Kim Stanley Robinson, whose new novel, 2312 , is his boldest trip into all of the marvelous SF genres—ethnography, future shock, screed against capitalism, road to earth—and all of the ways to thrill and be thrilled. It's a future history that's so secure and comprehensive that it reads as an account of the past—a trick of craft that belongs almost exclusively to the supreme SF task force of Le Guin and Margaret Atwood. His new book 2312 is bursting with so many ideas and vivid characters that readers will be almost upset to hear it's a stand-alone. How could anyone create such a vivid, believable, mind-bursting future and not want to explore it further? And also reviews in Fantasy Fiction, Tzer Island and USA Character Approved. Finally, a funny bit of trivia: the Linux Mint 13 has been named "Maya", in part in reference to Maya Toitovna!